With the help of a giraffe, education in Ethiopia is reaching new heights. After more than eight years of teaching, Abeba Eyasu, a primary school teacher at Addis Ababa Bole Gerji Primary School, was surprised to learn through a USAID-sponsored program that children’s learning is enhanced in classrooms that utilize media. Abeba’s school was selected to participate in the USAID-sponsored Tsehai Loves Learning- Healthy Whiz Kids project. For project, Whiz Kids Workshop created 39 new episodes of their beloved television series “Tsehai Loves Learning” starring Tsehai the giraffe, 12 new companion storybooks, and 8 Tsehai Corners in Addis Ababa and Debre Berhan in an effort to educate children and their families about key health topics. For the program, Abeba was trained on how to use the health-themed videos and books in her teaching. 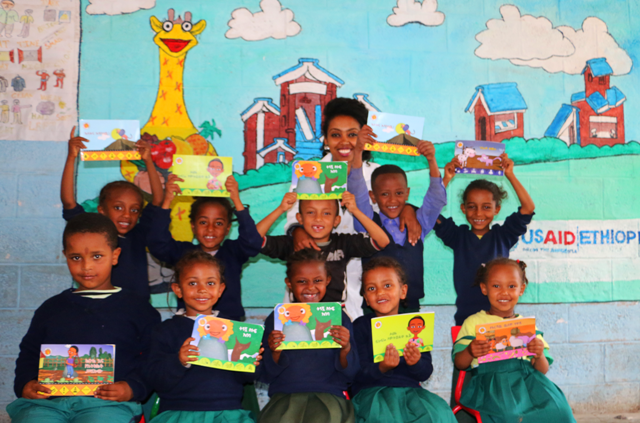 “Using Tsehai Loves Learning – Healthy Whiz Kids episodes taught me to value the importance of media for teaching children.” Abeba Eyasu, a primary school teacher, reflects on the value of Tsehai materials in her curriculum. According to Abeba, the change was immediate. Far from the tried-and-true lectures she had been delivering on the subjects, the Tsehai Loves Learning episodes offered a new and exciting way to engage her students. She reports that the creation of the Tsehai Corner at her school created an environment where her students became excited and eager to participate in class. In fact, her students now take special care not to miss class now that Tsehai Loves Learning screenings have been integrated into the curriculum. Parents have noticed and expressed their appreciation for the newfound interest their children have shown for learning about health topics.